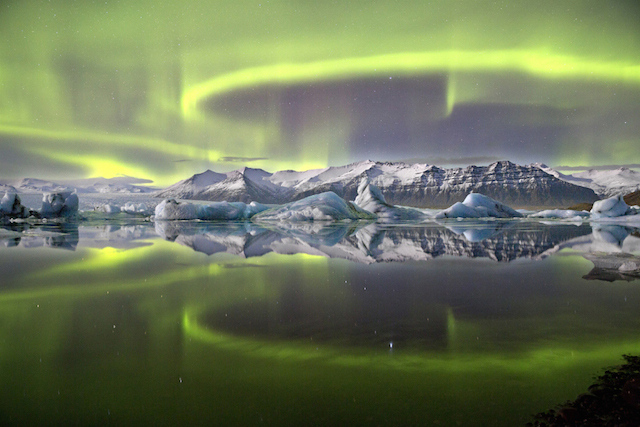 Earth and Space (and overall) winner) James Woodend (UK), with Aurora Over a Glacier Lagoon. A vivid green aurora is pictured above Iceland's Vatnajokull National Park, reflected almost symmetrically in Jokulsarlon Glacier lagoon. A complete lack of wind and current combine in this sheltered scene to create an arresting mirror effect, giving the image a sensation of utter stillness. Despite this there is motion on a surprising scale, as the loops and arcs of the aurora are shaped by the shifting forces of the Earth's magnetic field. People and Space winner Eugen Kamenew (Germany) with Hybrid Solar Eclipse 2. 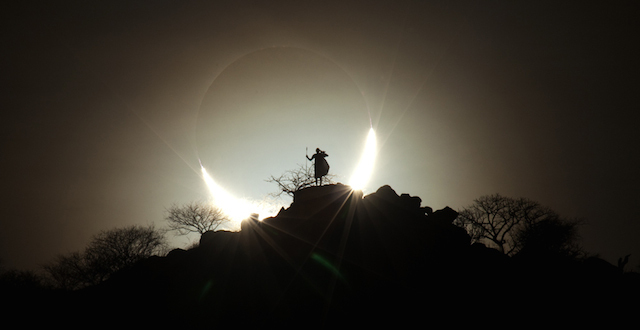 Sun and moon sink together behind a Kenyan savannah skyline, locked in an eclipse in which the moon is silhouetted against the sun's bright disc. This rare example of a hybrid solar eclipse took place in November 2013, beginning at sunrise over the western Atlantic as an annular eclipse, in which the moon does not entirely block the sun, leaving a bright ring uncovered. As the moon's shadow swept across the ocean, the eclipse became total, with the entirety of the sun concealed from view. By the time the eclipse reached Kenya the sun was once again emerging from behind the moon, creating the breath-taking crescent shape at sunset. The photograph also acts as Kamenew's tribute to a scheduled tour guide and photographic model for this shot, who was sadly killed before he arrived in Kenya. The Sir Patrick Moore prize for Best Newcomer went to Chris Murphy (New Zealand) with his Coastal Stairways. 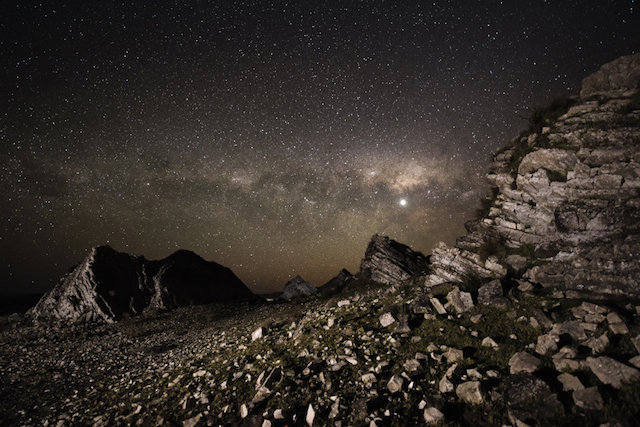 Rock formations in the Wairarapa district of New Zealand create a stark foreground and contrast to the dusty clouds dancing across the Milky Way. No light pollution and a clear, crisp night afford the photographer a fantastic opportunity to capture this image. Deep Space winner. Bill Snyder (USA), Horsehead Nebula (IC 424). The Horsehead Nebula is one of the most photographed objects in the night sky, but this image portrays it in a brand new light. The photographer draws the eye down to the creased and folded landscape of gas and dust at its base rather than focusing solely on the silhouette of the 'horsehead' itself. 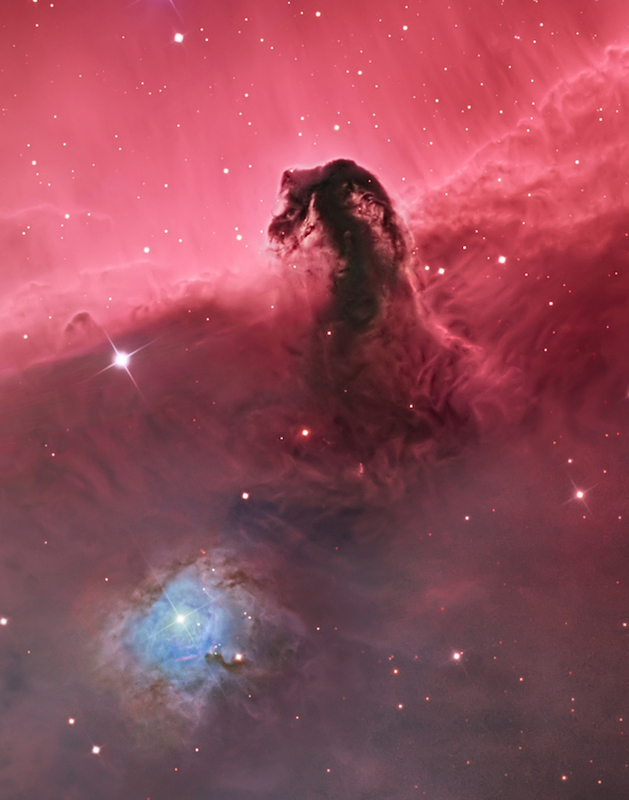 Snyder also includes the glowing cavity surrounding a bright star situated to the lower left of the horsehead. 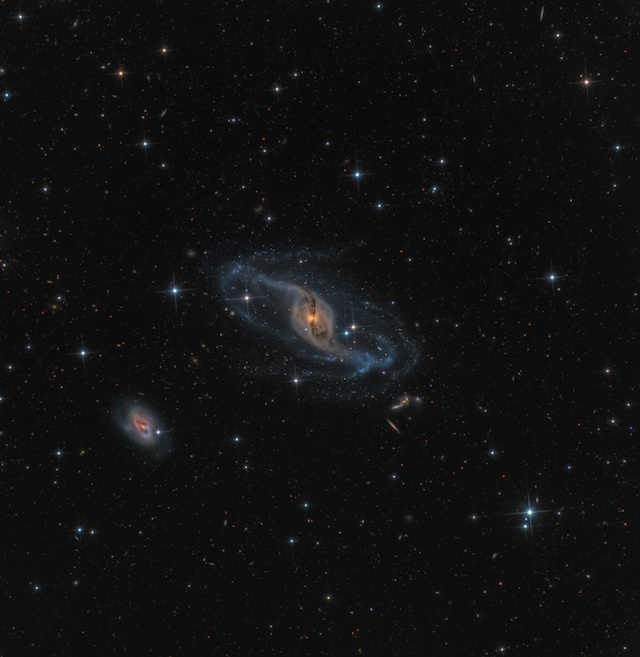 Robotic Scope Image of the Year, by Mark Hanson (USA) with NGC 3718. Our Solar System winner. Ripples in a Pond by Alexandra Hart (UK). The sun's boiling surface curves away beneath us in this evocative shot that conveys the scale and violence of our star. The region of solar activity on the left could engulf the Earth several times over with room to spare. 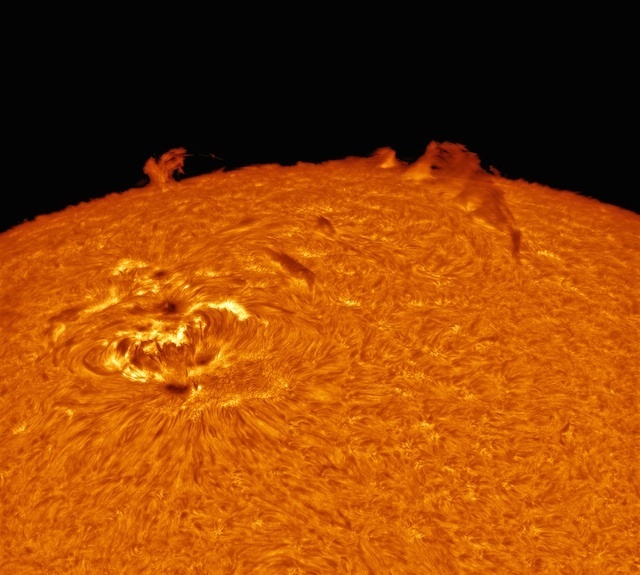 The sun's outer layers behave as a fluid, as alluded to in the image's title, and are constantly twisted and warped by intense magnetic forces. The annual prizes for best astronomy photography have been announced, and are now on display at the Royal Observatory, Greenwich. The show always attracts a broad range of images that appeal both to the eye and the mind. This year's selection includes a stunning aurora-topped landscape (by overall winner James Woodend), a fresh look at the famous Horsehead Nebula, and the 'ripples in a pond' of the sun's surface. The best images, including our selection above, are on show at the Royal Observatory. Originally meant to close in February, the exhibition has been extended until 19 July 2015. Astronomy Photographer Of The Year 2014 is free to visit, although other parts of the observatory require an entrance fee.